Two 24-by-24-foot signs are travelling from Regina to Nashville, Tennessee. 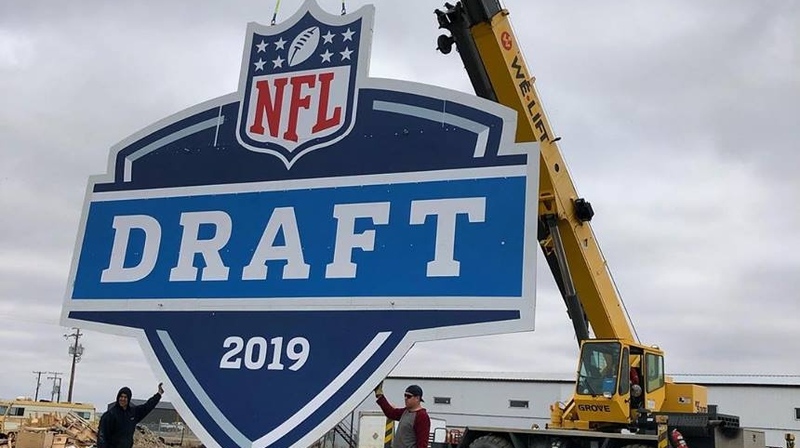 The custom signs were created by Davey Plastics Inc. for the NFL draft at the end of April. “(They’ll) be shown on the rooves when they are doing their overhead shots, I think mainly before and after commercials,” said Lonnie Maier, Davey Plastics Inc. owner. A production company Maier used to work with, which is now based in Nashville, reached out to Maier to see if he could do the job. Maier jumped at the opportunity, but said it wasn’t an easy feat. With the help of a few other Regina companies, the signs were completed within the five-week deadline. This is the company’s first job with the NFL, and Maier said he is looking forward to seeing his work on display at Nissan Stadium. “That'll feel really good. I really haven't had that big of a job in that popular of a setting before, that's for sure,” Maier said. Photo courtesy of Davey Plastics Inc.